During the reading section of the OET exam, it is likely that you will be faced with a number of vocabulary items which you will be unfamiliar with. Whilst terms such as myocardial infarction and tachycardia are unlikely to cause any problems (you are all healthcare professionals after all) other terms such as elaborated, messed up and be-all and end-all are likely to prove trickier. Agree? In some cases, we can ignore vocabulary that we are unfamiliar with. If the questions do not demand our understanding of unfamiliar terms, then it makes no sense to waste time trying to work them out. In other cases, however, it is of great importance that we are able to make sense of initially unfamiliar vocabulary because: (a) that vocabulary will help us make sense of an overall idea which we need to understand in order to answer one of the questions and/or (b) a question in the test itself focusses specifically on the understanding of unfamiliar vocabulary. The latter will occur in section C of the exam as two of the 16 questions are dedicated to detecting the meaning of words or phrases from context. The former is likely to apply to a much greater number of multiple-choice questions in parts B and C, so it is worth honing our strategies in order to tackle these questions as effectively as possible. So, how can we improve our techniques in this area? I shall provide three crucial steps. 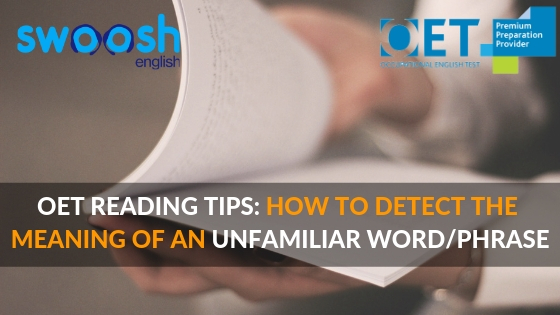 When trying to work out the meaning of an unfamiliar word or phrase, the first thing that we need to do is to try to relate it to the wider sentence. One way of doing this is to try to detect its function; for example, is it operating as a subject or object? Or might it be a verb or complement? So, what is the function of this phrase within that sentence? Well, we have a typical clause structure here which is subject-verb-object (adenosine=subject; are=verb; by no means the be-all and end-all= object), as the phrase we need to understand is the object of the sentence, it is very likely to be a noun (as most objects are). So now we know that we have a noun phrase which relates to adenosine level’s effects on the brain or the body. 2. Is it positive or negative? This is quite a crucial question as misunderstanding whether a word or phrase is positive or negative can give us a very different impression of its meaning. The sentence “Sleeping tablets will prove effective.” has a very different meaning (the opposite in fact) to “Sleeping tablets will prove ineffective.” Understanding negation, therefore, will help us understand the meaning we are looking for. In the phrase “by no means the be-all and end-all” we have the word “no”, which, as the most common way of expressing negation in relation to a noun phrase in English, looks very likely as if it’s creating a negative phrase. In fact, the entire phrase “by no means” can be seen as having the impact of providing negation such as in the phrases “in no way” or “under no circumstances”. Therefore, the effect of adenosine levels is being described as not being something rather than being something, which, as we’ve established, is a crucial difference. Connectors are words or phrases which help to determine the relationship between sentences or clauses. If we can find a connector near our unknown phrase, then we can detect its relationship to a preceding or following phrase. Which is the same idea but stated in an affirmative sentence rather than a negative one. Success! And we have worked this out via looking at the context in which the phrase appears. This is quite fortunate as, in the OET exam, that’s exactly what you are required to do. How can you prepare for the OET exam EFFECTIVELY? 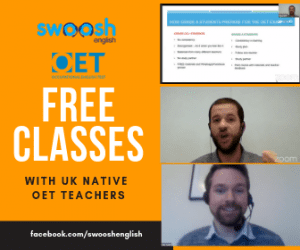 Join our Deluxe self-study package for only $149/month where you will get video courses on all 4 areas (OET writing, reading, speaking & listening), 10 writing corrections per month, OET mock test + more. If you have any questions, put them in the message box below! Now it is time to practice….are you ready? This is because the body stops producing the appropriate levels of neurotransmitters that ADHD drugs replace − a trademark of addictive substances. What function does the word “trademark” play in the sentence? What kind of word is it grammatically? A verb, a noun, or an adjective? 2. Look at the sentence again. Is the word trademark being presented in a positive or negative sentence? How do you know this? 3. Look at the sentence one more time. What connecting word or phrase is used? What is the function of this? 4. Now look at the two sentences which come before our original sentence. How do they help us to understand the meaning of the word trademark? 5. Look at your answers to all the previous questions. What do you think the word trademark might mean in the context of the original sentence? 3. Because, which is used to provide a reason or explanation for something. It indicates that we should read the preceding sentences to discover more information. 4. It provides a wider context for the word and shows that the information is being given as a quotation. More importantly, it demonstrates that the focus of the quotation is to provide information as to how ADHD medication acts as an addictive substance by having a physiological impact on the patient in a similar manner to other stimulant medication. Important OET Speaking Role Play Advice- This lesson will help you speak for the full 5 minutes!